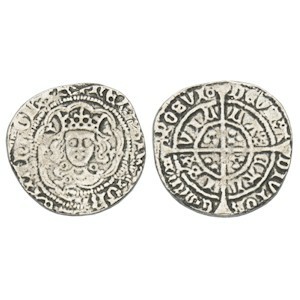 Obverse: Crowned bust of Henry VI facing, neck flanked by two annulets, within a tressure of nine arcs. Text around HENRIC DI GRA REX ANGL Z FR. Reverse: Long cross with three pellets in each angle, annulets in two opposing angles. Text around outer POSVI DEVM ADIVTORE MEM. Text around inner VILLA CALISI (the final I overstrikes the S).